Longtime flight instructor and Maui Flight Academy owner Laurence Balter will happily show you every bell and whistle in the glass cockpit of his Cirrus SR22, and he will just as happily shut it all off—covering every instrument except the angle of attack indicator. That, in Balter’s view, is the only instrument a pilot really needs. Yet many still go without. Laurence Balter, left, teaches students to use angle of attack to maintain control, make better landings, and increase safety. Background image by Laurence Balter, foreground image of BendixKing KLR 10 courtesy of BendixKing. 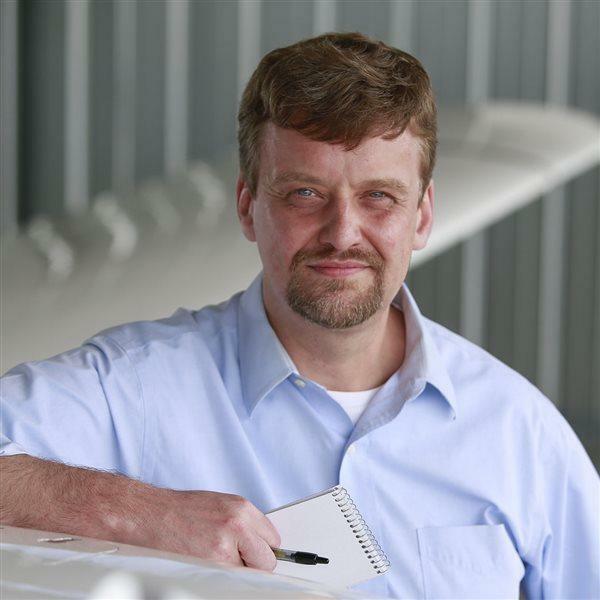 Balter, who has given dual instruction to thousands of pilots, said he has yet to encounter even one who already flies with an angle of attack indicator (also known as a lift reserve indicator) in his or her own aircraft, or rental aircraft. While the FAA cleared the way in 2014 for more affordable retrofits for the certificated fleet, many aircraft are still without the relatively simple and potentially life-saving technology. Many if not most of the active aircraft in general aviation give their pilots no direct indication of lift, and certainly not the sweet spot where the ratio of lift over drag is at its zenith, a particularly important piece of information to have if the engine just stopped turning. Impossible turn? It might be doable with an angle of attack indicator: Balter demonstrates this, at altitude, in one of several videos he has posted online to build understanding of and demand for angle of attack indication. Balter said in a telephone interview that it is no coincidence that the annual toll of loss of control remains steady, about four in 10 fatal accidents attributed to the pilot’s loss of aircraft control. This is exactly the problem that the BendixKing KLR 10 (which typically retails for around $1,600, depending on installation options) and similar products are designed to improve: aircraft control. To drive this point home, Balter has a habit of covering up the fancy glass panel displays and leaving only the KLR 10 mounted just behind the windshield for his student to reference. In another video, a retired Marine Corps carrier pilot takes the Cirrus in for a landing using only the angle of attack indicator for reference. Balter said he also has invited pilots to go flying with their nonpilot spouses, and watch as he teaches the nonpilot how to land, guided primarily by the angle of attack indicator. Balter created a Facebook group to promote and discuss flying with angle of attack indication. A GoPro mounted near the KLR 10 in his Cirrus SR22 has captured hours of footage, which he has edited into a series of short videos posted online along with other resources that explain why angle of attack is important, and how to make the best use of angle of attack indication. He has flown with aviation celebrities including AOPA President Mark Baker, who pointed out during their time together another frustrating trend in general aviation: most students who start training never earn a certificate. A broader understanding of angle of attack, and giving every pilot a clear picture of it in the form of red and green dots, and the blue doughnut that indicates (on the KLR 10, and other models) maximum lift over drag, which also happens to yield the best glide endurance, could save many lives, Balter believes, as well as flying careers that would otherwise be cut short by apprehension or fear. Simply put, “don’t go beyond the blue doughnut, (and) you will stay safe,” Balter said. After flying with a BendixKing board member, Balter worked out with the company a program to help prime the pump and hasten adoption of angle of attack indicators across the fleet: flight schools can now purchase units for their own fleet at wholesale prices, and individual customers can obtain a $150 rebate. Balter created a website to sell KLR 10s and other models, and he said the primary goal is to spread angle of attack indicators, not collect profit. “I’m not charging anything more than anybody else. In fact, I’m charging less,” Balter said. While he’s happy to be the one selling, the more important thing, he said, is that these devices are sold, installed, and used. Balter said he’s working to pitch in with a business model for angle of attack indicators made by industry leaders that requires prices to stay low to make the devices as accessible and affordable as possible, an approach that leaves little room for marketing. By taking on that role, Balter believes he can educate consumers and realize the safety-enhancing potential of this instrument.